We all want to improve our public schools. But school improvement should not come at the expense of harming millions of children. In this section, we will look at the severe harm inflicted on millions of children by high stakes tests. Below is just one of these millions of children. It is a five year old girl who was originally excited about attending Kindergarten. But after five hours of testing, she was reduced to tears because she did not know how to answer the questions on her high stakes test. Needless to say, her mother is now an opponent of high stakes tests. 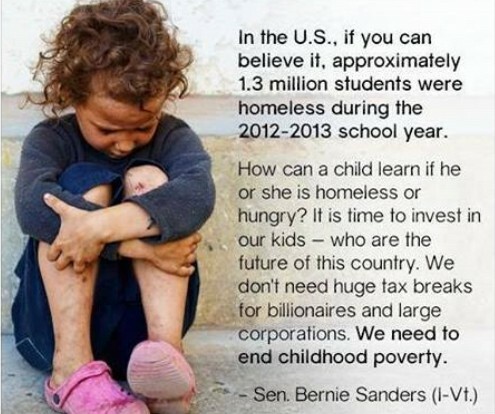 There are many ways this greedy plan by billionaires and corrupt politicians has severely harmed our kids. Below we will summarize just a few of the harms of toxic high stakes tests. First, toxic tests force teachers to “teach to the test” rather than focusing on meeting the needs of each child. 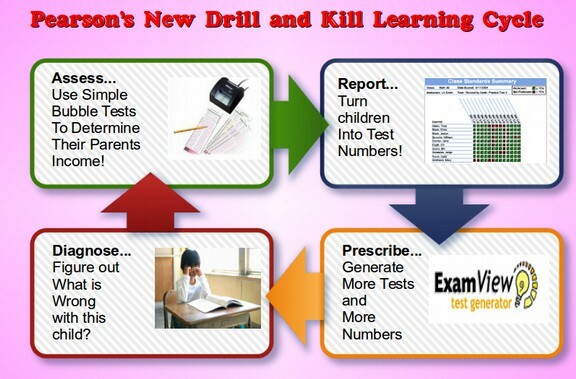 Instead of helping children explore subjects with their natural curiosity, schools are turned into prisons that focus on “drill and kill” direct instruction and memorization of an endless series of facts that might appear on the next high stakes test. Below is a link to brief 3 minute video of a billionaire designed Direct Instruction Kindergarten math curriculum in action (Warning: This video looks more like a military indoctrination boot camp than a Kindergarten class. If you are a sensitive person, you may want to skip this video. (It still gives me nightmares.) Below is a scene from the video. Toxic testing requirements forced schools to devote months to drill and kill test preparation. This left no time for art, music, recess, physical education, critical thinking, creative writing or support of independent questioning and learning. Time for physical development, PE, and recess has been shortened in many schools to increase time for drill and kill instruction and testing. This is harmful because brain development in young children requires physical activity. Young children were never designed to sit strapped to chairs all day. Reducing physical activity has led to an epidemic of childhood obesity in the US. Some schools even shorten their school lunch period to have more time for test preparation! Fifth, forcing elementary school children to take high stakes tests is developmentally wrong and especially harmful to elementary school children. The test of Kindergartners leaves many crying because they do not know what A, B, C and D mean. The test of Third Graders is even worse. Last year, a Third Grade girl in Florida started crying when she got a score of 181. She needed a score of 182 to go on to 4th Grade. Prior to this, she had all A's in school. Her twin brother went on to 4th grade while his sister was required to repeat 3rd Grade. Of course, the mother of the twins is outraged. "My heart breaks for her, nobody wants to see their child cry,” said her mother. “When she found out she had to go back to third grade again she was crying bad, I mean she was devastated." Sixth, high stakes testing increases student anxiety and reduces student motivation to learn. 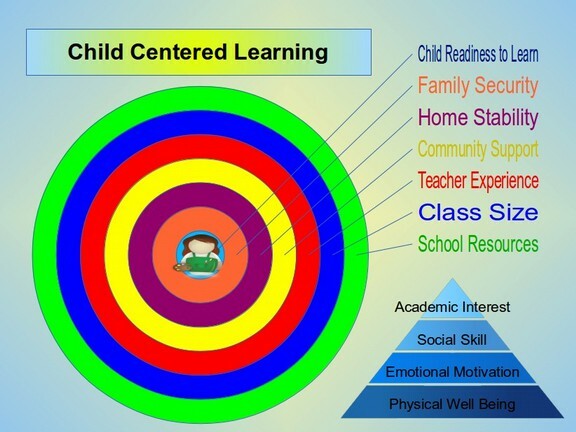 A basic principle of child development is that motivation precedes academic learning. Killing a child's desire to learn harms a child's ability to learn. 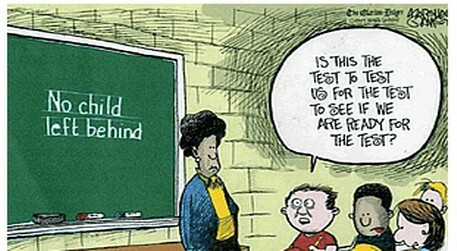 Failing NCLB high stakes tests harms a child's self esteem and sense of self worth. Children internalize these negative beliefs and later fail to even try to learn. This kind of harm failed to take into account that children develop at different rates. One reason some kids drop out of school is they are not given the help they need to pass high stakes tests. They fail a math test and conclude that they are simply “no good at math” or have no chance of passing a course needed for graduation. Dropping out of school leads to all kids of problems like drug abuse, crime and going to prison. Failing high stakes tests can also lead to teen suicide as the child's self worth becomes so low they no longer believe life is worth living. In particular, young boys develop academically at a rate that is one to two years behind young girls. An entire generation of normal young boys as been labeled as failures by the insanity of NCLB. High Stakes Tests create High Risk Kids! Learned helplessness is a specific consequence of one particular form of psychological stress: being given an impossible task. The problem in giving small children tests that most cannot possibly pass is that small children and small dogs lack the coping responses to uncontrollable stress (also called self regulation and self esteem) that we adults have. Instead of responding positively to stress as a challenge to improve, small children are much more likely to internalize the message that they are no good and give up trying to learn at all. 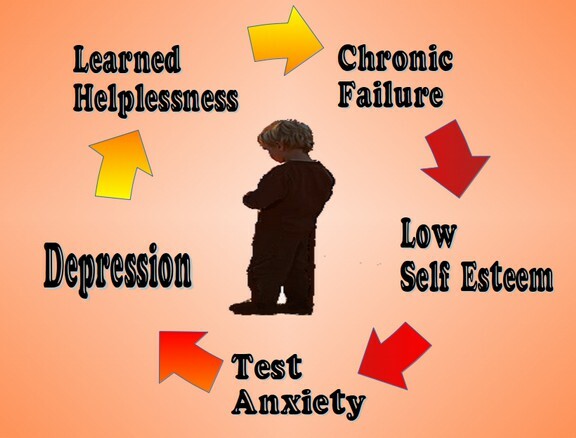 Ninth, chronic stress leads to a downward spiral that permanently harms a child's emotional, social and academic development. Threats, penalties and punishment demoralize teachers and students. We know from brain imaging studies that the emotional development of the brain precedes cognitive development. Anything that harms the emotional development of the child also permanently harms the cognitive development of the child. This is why subjecting kids to the chronic stress of high stakes tests is a form of child abuse. Children blame themselves and are forced to live with the guilt that their poor performance on a single test caused their beloved school to be closed and their beloved teacher to be fired. The purpose of flunking students is to erode support for public schools and thereby make it easier to close and privatize public schools. According to the National Center for Education Statistics, about 2,000 public schools per year have been closed in the US since the push for privatizing schools began in 2004. This is double the rate of school closures in the 1990s where about 1000 public schools closed every year. These school closures affected the lives of over 300,000 students per year who now live with the guilt that because they failed a test, their school was closed. In ten years, 3 million children have been subjected to losing the school they love. Tenth, endless meaningless high stakes tests are degrading to students. The high stakes testing movement is led by Pearson, one of America's three largest textbook publishers and test-assessment companies. Pearson will, at least in part, be using the automated scoring systems of Educational Testing Services (ETS), proprietor of the e-Rater, which can “grade” 16,000 essays in a mere 20 minutes. Pearson will make more than one billion per year by rapidly grading high stakes tests of students. 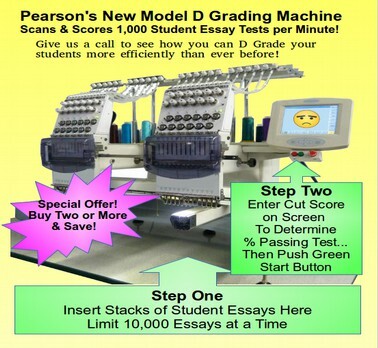 The Pearson machine should have been called the D Grader since what it really does is degrade students. If the D Grader machine can grade 16,000 essays in 20 minutes, how many can it grade in 2 minutes? If the D Grader machine can grade 1,600 essays in 2 minutes, how many can it grade in one minute? If the D Grader machine can grade 800 essays in 60 seconds, how many can it grade in 6 seconds? If the D Grader machine can grade 80 essays in 6 seconds, about how many can it grade in one second? If the average 3rd grader takes 30 minutes to write their high stakes essay on which their passage to 4th grade depends, how many seconds will the Pearson Degrader spend making this decision about the child's life? How many years in prison should the wealthy charlatans at Pearson get for degrading the lives of millions of children just to make a quick buck? High Stakes testing harms poor kids most by ignoring the real cause of school failure which is childhood poverty. Again, poor kids are most likely to do poorly on standardized tests because they do not have the advantage of a stable home and educational resources enjoyed by rich kids. The issue with students in poverty is that they are in poverty. They don't need their schools closed. They need their parents to have jobs. 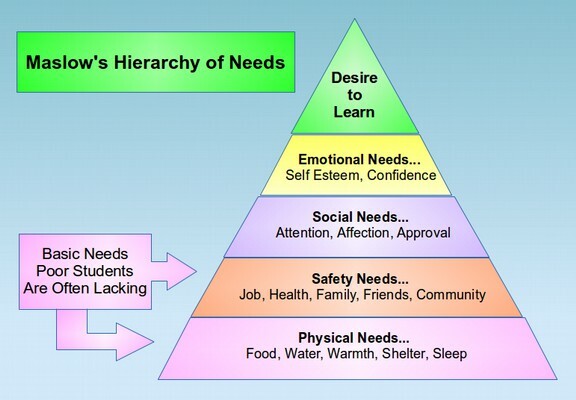 It is tough for a kid to do well in school when they are hungry and living in the back seat of a car. The real problem we are facing as a nation is a lack of good paying jobs – not a lack of smart hard working kids! This is the danger in accepting an education reform agenda developed by billionaires and Wall Street Hedge Fund Managers rather than by child development specialists. A child development specialist would know there is a huge difference between a real child and a computer program. As Psychologist Abraham Maslow pointed out, children have emotional needs for acceptance, attention, affection and approval. A computer has none of these needs. As we have seen throughout this book, the greatest threat to child well being and academic success is poverty. However, because high stakes tests remove a safe learning environment and replaces it with a high stress learning environment, these tests turn our public schools into a toxic danger that causes permanent long term harm to children. Those who advocate high stakes tests are not only wrong. 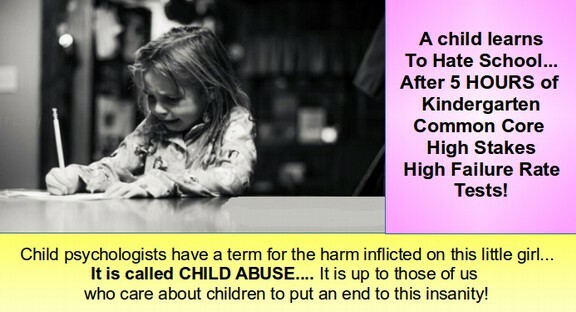 They are committing child abuse and should be put in jail where they can no longer inflict harm on our children. Those familiar with the child development theories of Lev Vygotsky call the assessment of task difficulty the Zone of Proximal Development or ZPD. You can think of it as a Goldilocks Principal in that a task can be either too easy or too hard. This principal states that children learn best when assisted by a more knowledgeable other (typically a parent and/or teacher) who helps the child learn a task that is just out of the reach of a child. 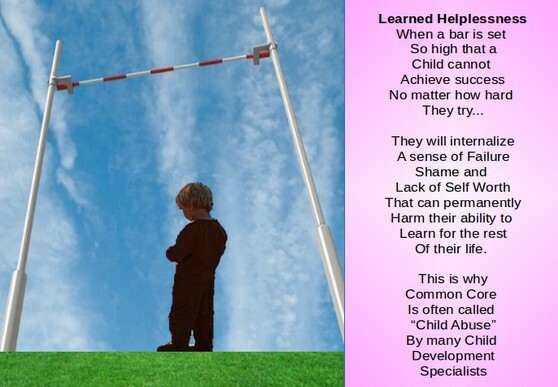 In other words, raising the bar will only result in improvement if the bar is set at the correct height and if the child has the assistance of an experienced teacher. Common Core fails to set the bar at the right height and fails to provide children with an experienced teacher. 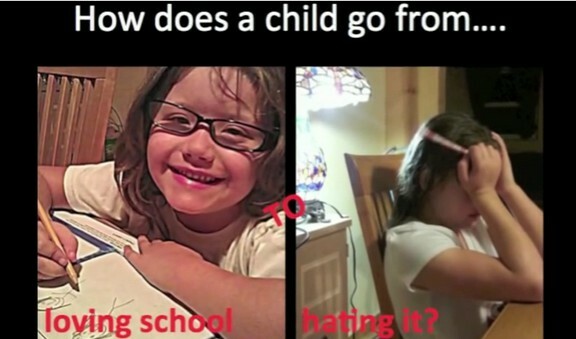 This is why it is so harmful to children. There is a corollary to the ZPD. First, each child has a different ZPD. One of the tasks of a teacher, and one of the benefits of smaller class sizes, is that the teacher can better assess the ZPD of each child. Forcing all children to jump over the same bar or pass the same high stakes test harms more children than it helps. 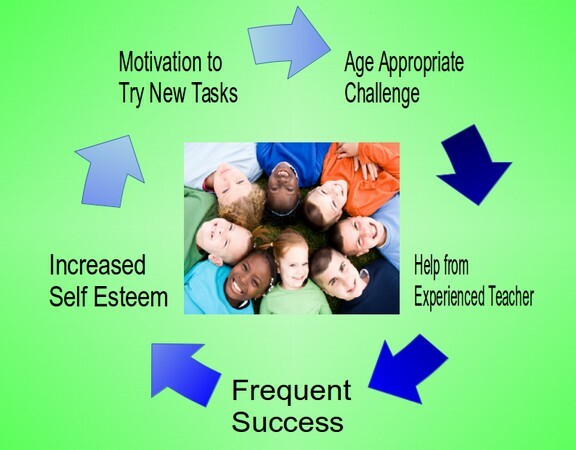 Individualized instruction is important because if a task is set too far beyond the child or outside of the child's zone of proximal development, instead of improving, the child's self esteem will be so badly harmed by a sense of failure that the child will regress into a sense of “learned helplessness.” An important and overlooked aspect of child development is that if a parent or teacher or other adult figure tells a child they are a failure, then the child will believe them and internalize this belief. One can think of the ZPD as being like the child's story of Goldilocks and the Three Bears. Standards can be too low. But they can also be too high. 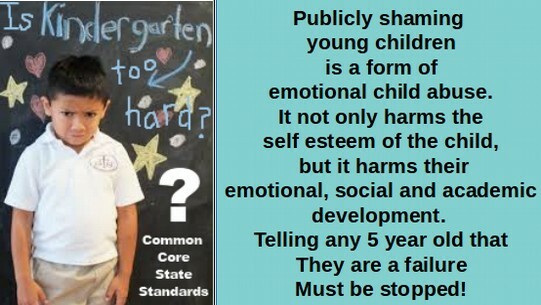 And damage from standards that are set too high are much worse than standards that are set too low because in harming the self esteem of the child, excessively high standards permanently harm a child's natural desire to learn and their belief that they are capable of learning. 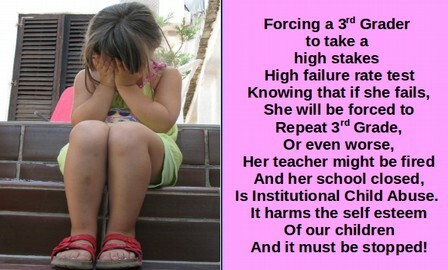 High stakes tests that set the bar too high harm the child today and tomorrow and for many years to come. Piaget found that children go through stages of development where young children go through a period of magical thinking followed by concrete thinking using real world examples before eventually reaching a stage of abstract or formal thinking sometime in high school or college. This process varies from child to child. Sadly, standardized testing often asks young children abstract questions that their brains literally have no way of understanding. Nor does raising the bar and shaming children and subjecting them to unfair high stakes tests lead to a quicker transition from concrete to abstract thinking. Instead, raising the bar too high merely harms the child by making them think that they are stupid and not capable of learning. 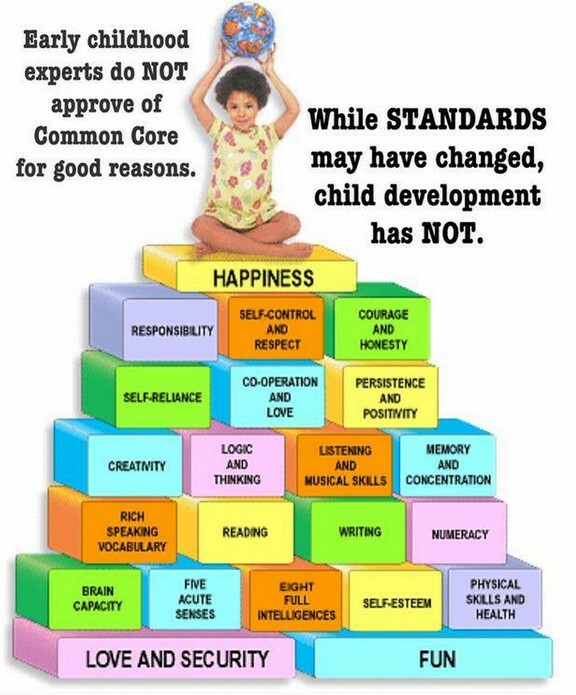 Children deserve fair testing that recognizes the complexity of child development and respects each child's current level of development and provides them with appropriate and individualized learning goals. High stakes tests bring in hundreds of millions of dollars a year to the handful of corporations that produce the tests, grade the tests, and supply materials to raise students’ scores on the tests. They also promote acceptance of a corporate-style of external rewards and punishment, which children then internalize as natural and even desirable. Tests are not used to help students improve. Instead, they are used to rank children and label children as failures. This corporate driven view of education is the opposite of a child centered view of education wherein the goal of public schools is to foster a child's natural desire to learn and help every child succeed in school and in life. Caring, empathy and love are not listed in any educational or business standard, but they are found in the best of schools. High Stakes Testing is not only Degrading for Students, it is Degrading for the thousands of Adults forced to give scores to students who they have never met. 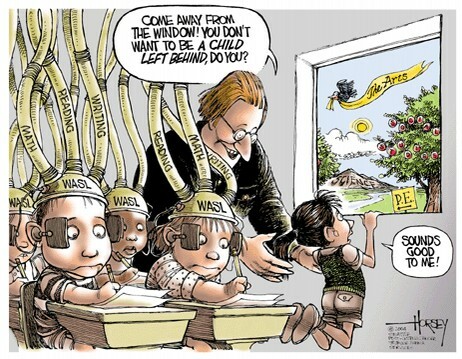 Sadly, the high stakes testing industry is completely unregulated. The high stakes testing industry is not accountable for the tests that are used to hold schools accountable. Unqualified evaluators operating in sweat shops grading factories use scoring methods lacking any scientific validity to pass judgment on our children. This is a job that should only be done by experienced classroom teachers who know their students well. Seventeenth, data mining of small children ought to be illegal. Even worse than the lack of reliability or validity of student test scores is what happens to these test scores after they are reported. Data for small children is placed on easily hackable servers where it can become part of a child's permanent record affecting not only their ability to get into a good college, but even their ability to get a good job later in life. Data mining small children is a violation of their constitutional right to privacy. 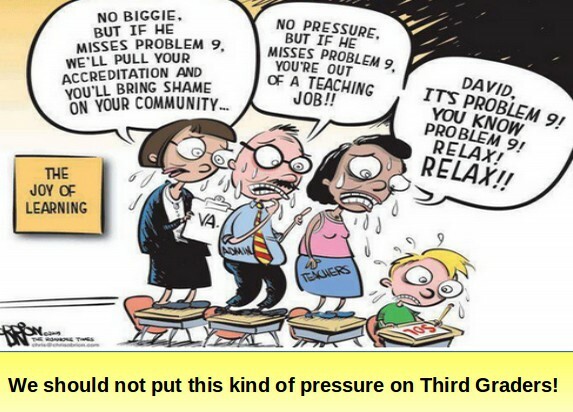 Eighteenth, forcing children to endure 13 years of high stakes testing leads to self centered adults who see the world as a competition instead of a caring community who understand that we are in in this together. Students are conditioned into the greed/competition model from an early age – making competition appear quite natural to them, and so fully indoctrinated they step into the marketplace to perpetuate and inflict this model on others who are viewed as both the competition and the enemy. The focus on winning at all costs and seeing others as ‘the competition’ fuels divisions between people, leading to conflict, suffering, dehumanization and even war. Instead of viewing children as unique individuals, with innate gifts and talents, they are viewed by billionaires as merely cogs in the corporate profit machine... robots to be made “career and college ready” as quickly as possible. The drive to compete and avoid failure leads to harmful hidden consequences... stress, anxiety and depression. Instead of freedom to learn there is only the slavery to conform.. to get the right answer on the next high stakes test. Fear of failure is the weapon used to keep children in line. The whip of competition leads to an early death of the soul. Competition sets people against each other. For harmony and social justice, cooperation and sharing encourages trust and builds relationships. 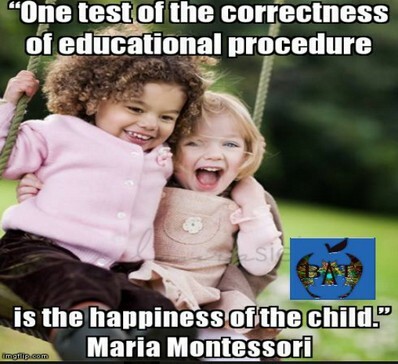 Conversely, there can be no enduring happiness for all as long as our children are taught to accept the nonsense that competition and judging children by fake test scores is all that is possible. It is time to put an end to toxic high stakes tests. Click on the link below or the menu item above to learn how to opt your kids out of endless pointless harmful high stakes toxic tests.